FDU Magazine Online is best viewed with Mozilla, Safari or Internet Explorer 5.1 and higher. FDU Magazine comes to you online with enhanced content and the chance for you to comment on the stories on our blog at MyFDU.net! Fifty years ago, a campus was born in Madison, N.J. The doors opened to students clad in suits and ties, dresses and bobby socks. 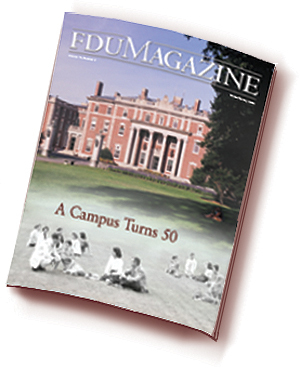 FDU Magazine Online brings you back to the early years of the College at Florham, guided by professors Walter Savage and Malcolm Sturchio. View additional Internet-only memories of Florham. Then catch a glimpse of the campus today and in the future with Provost Kenneth Greene. Students who live on campus don’t forsake the comforts of home. In fact, many bring a piece of home with them. From cherished photos to family heirlooms and from special souvenirs to stuffed animals, FDU Magazine takes a look at some mementos that keep students close to home. In an uncertain world, anxiety can frustrate and overcome many children and their parents. FDU professor Andrew Eisen, who directs the University’s Child Anxiety Disorders Clinic, describes the different types of child anxiety, the reasons behind the worry and some practical ways to help children face their fears. The long-time partnership between Fairleigh Dickinson University and the United Nations is growing even stronger. In September, during the annual Academic Convocation, the University bestowed an honorary degree upon U.N. Secretary-General Ban Ki-moon. Explore the historic significance of this visit, and read about the awards presented. Meet several FDU students who have played active roles in U.N.-related activities and conferences. You will find bonus images here that are not included in print!